This vegan spin on beef bourguignon features tender eggplant, mushrooms, and veggies simmered in a flavor-packed red wine base. Serve over pasta or mashed potatoes for a knock-your-socks off delicious vegan dinner. It seems like lately I’m boozing up all of my recipes. What can I say" The cold weather just gets me in the mood for infusing my cooking with all kinds of wine and beer and liquor. And this is no exception. This is one boozy stewzie. I just said “stewzie.” I don’t even know if I spelled it right. Okay, so stewzie isn’t a word, but whatever. Red wine with some herbs and seasonings makes an incredibly flavorful stew base. 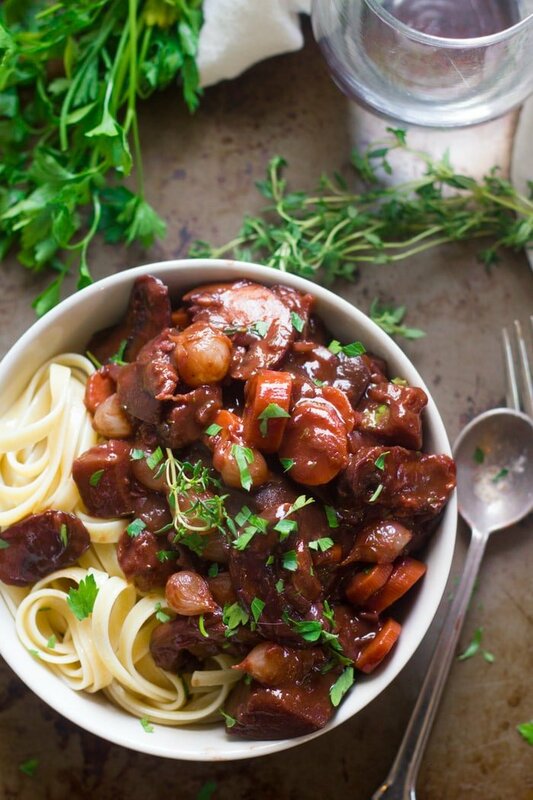 I’ve never had beef bourguignon, but I can’t imagine you’ll miss the meat with all the flavors in this vegan version. There are quite a few versions of mushroom bourguignon circulating on the internet (I even did one myself a while ago), so I decided to do something different here: I swapped eggplant for the meat. OMG. Best decision ever.